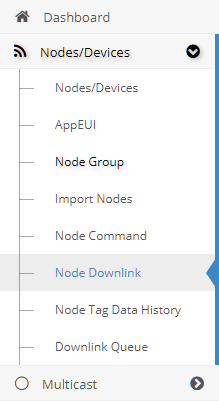 The Downlink item is simple to find: it is placed under the Nodes menu, on the left side. DevEUI: The node to wich send data. The first field is the Node DevEUI, the second one is the Node AppEUI and the last one is the Node Name. Data: The data to send to the node. 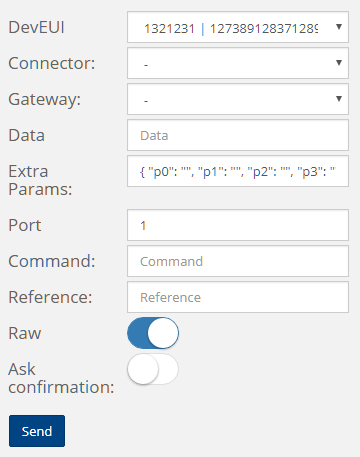 Command: This field need to be filled according to your websocket configuration. Connector: (Not required)The connector used for the comunication. Reference: When a Node recieve a message and notify us this value let us know to which message it refers. Extra Param JSON: This params are used for dynamic topics. For example if the server require to know the issuer, the "p0" will be "User": "Admin". Clicking on a single row will fill the input form with the data contained in the line.